In an interview you mentioned that 1940's costumes are easier to make. Could you please elaborate? I read an article called "Buying Costumes in Egypt and Turkey" at the now-defunct Bellydance New York web site. She described the differences between today's standard Egyptian ready-made costumes and the "Retro" trend, reminiscent of 1940's stars such as Nadia Gamal. If you imagine the glamorous formal gowns of that era with their form-fitting, yet softly draped dressmaking and luxurious fabrics, that is what a "Romantic" style of belly dance costume resembles. It's easier to make, because it doesn't rely on stiff, heavy, all-over beaded, fringed and sequined embellishment, which is very time-consuming and expensive to do. In "Romantic" style, the light-to-moderate beading, fringe or sequins adorn or outline, rather than encrust, the costume pieces. Try watching a campy 1949 Hollywood movie, "Samson and Delilah", for this style of ultra-glamour. Delilah (stunning Hedy LaMarr) has some fabulous slinky skirts, draped veils and panels, one-shoulder bodices, clusters of pearls, and jeweled snoods! Of course, we can't all be as physically gifted as Hedy Lamarr, but I also think this style is more flattering to most of us, because the costume will not outshine the dancer. The audience will be thinking "beautiful bellydancer", not "chick wearing a tight holographic neon green and orange sequin bikini costume with fifty pounds of beaded fringe and twelve cut-outs". The drawing to the right shows my version of a Romantic costume. 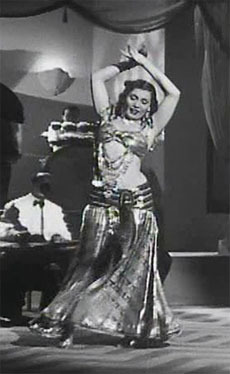 Tahia Carioca was the very first Egyptian dancer to appear in a motion picture, in 1935. Her career was at its peak in the 1940's. This photo is a still from a scene in the movie Shatie el-Gharam (Shore of Love), which was released in 1950. Her costume gives an idea of what Egyptian dancers wore in the 1940's. 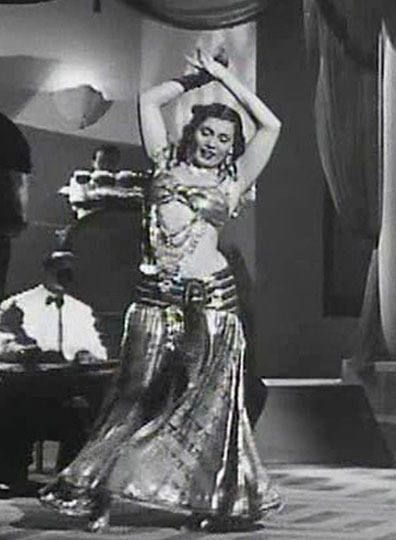 Samia Gamal was another legendary Egyptian dancer of the 1940's. Her career began about 5 years after Tahia Carioca's, and the two of them were rivals for many years. King Farouk of Egypt named Samia Gamal the National Dancer of Egypt in 1949. This photo is a still from a scene in the movie Afrita Hanem (The Genie Lady), which was released in 1949.